Just How Good is Willie Taggart’s 2017 Recruiting Class? On any college football team there is a direct correlation between NFL-caliber talent and winning. Sure, there are extenuating circumstances that explain why a very talented team under-performs – such as injuries, chemistry or coaching. But talent matters; it always has and it always will. The dearth of talent on Oregon’s 2016 football team manifested itself in the 2017 NFL Draft when a grand total of zero eligible former Ducks were drafted. Problems too numerous to count hastened the departure of the previous coaching regime and Oregon proceeded to hire outside the organization for the first time in a generation. This resulted in the spectacular hire of Willie Taggart – a coach with a track record of turning programs around. 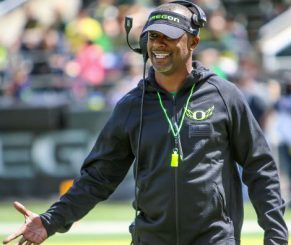 The personable and energetic Taggart wasted little time in his new capacity as head football coach at UO. Various internet-based recruiting websites ranked the Ducks’ 2017 recruiting class between No. 16 to 23. 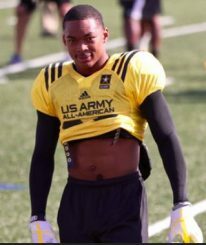 The recruiting site campusinders.com ranked Oregon’s class an eye-opening No. 16, followed by 247sports.com’s opinion that the Ducks’ class was No. 19 in the nation. 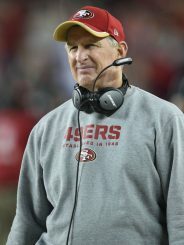 Bleacherreport.com opined that the Ducks were No. 22 and ESPN.com brought up the rear at No. 23. This is a remarkable result given the short time-frame Coach Taggart had to contain the fallout from the previous regime’s dismissal. And he did this while putting a new coaching staff together! The star gazers at some of the internet recruiting sites got a portion of this class right. However there are numerous kids in this class they clearly underestimated. Coach Taggart and his staff, however, did not – because they have clearly demonstrated exceptional talent evaluation skills as a group. 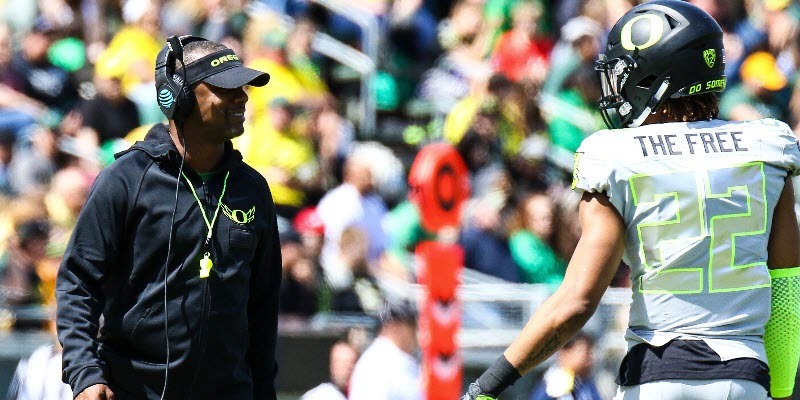 Half of the Oregon staff has professional football experience, and it appears it guides their talent evaluations like a pro personnel staff. They use triangle numbers (height, weight and speed) as opposed to star ratings as their salient criteria. This hard data is tempered due to the age of the players (most are 17 and 18-year-olds), because they’re still growing into their bodies. This is challenging because, for example, a kid may look like an outside linebacker at 17 years of age, but he may only be 95% of his eventual height and 85% of his eventual weight. The projection is that he may end up as a strong side defensive end in a 4-3 scheme, rather than an outside linebacker. I have broken down these players into three groups. The first group carries an NFL 2nd-round draft grade or better when they are eligible three years from now. The second group includes mid-rounders (3rd through 5th). And the last group is composed of late-round picks or free agents. Elite triangle numbers (6’6, 315 lbs.) and rare athleticism for a guy his size. He is light on his feet and scouts call guys like him a “Dancing Bear.” Solid run blocker and excellent in pass protection, although he needs to develop a hand punch and re-direct. Potential late 1st-round pick, and will anchor the left side in the NFL for 10 years. An absolute wrecking ball. Powerfully built (6’1, 330 lbs.) and can play the point in a 3-4 or as a 3-Tech in a 4-3. Unusual athleticism for a guy his size, and plays with great leverage and is relentless. He reminds me of the great Casey Hampton of the Pittsburgh Steelers, and is a potential late 2nd-round pick. A quick twitch kid. Fast, smooth, and well-coached as an elite bump & run guy. He understands how to use the sideline as another defender. A little undersized but makes up for it by being tough, aggressive and competitive. Boundary corner is his best position, and he carries a solid NFL 2nd-round grade. Not quite as quick twitch as Graham, but bigger. Possesses NFL CB triangle numbers coming out of high school (6’0 – 190 lbs. – 4.45 40). A tough, very physical kid. Boundary corner all the way, as he’s only going to get bigger & faster. Solid 2nd-round grade. With a great career at Oregon, he could sneak into the bottom half of the first round. Impressive triangle numbers (6’3, 280 lbs. – 4.7 40). Great athlete bordering on elite. Unusual combination of size and speed. Defensive end in the 3-4. He can hold the point, but more importantly can set an edge. High motor guy and relentless in pursuit. Reminds me of Chris Long, who played for the St. Louis Rams. Solid 2nd-round grade. A freakish athlete who recorded a 138.38 SPARQ (Speed-Power-Agility-Reaction-Quickness) at the Opening between his junior and senior year of high school. Recently recorded a 46″ vertical. An explosive all-purpose guy with a legit 4.48 40. He reminds me of Jamaal Charles. Carries a solid 2nd-round grade. In my opinion the best player at any position in this class. An NFL talent at two positions. He carries a 3rd-round grade at running back on triangle numbers alone (6’1, 220 lbs. – 4.5 40), but I believe that he is an elite talent at safety. I would suspect he is a late 1st-round pick. If he tests at the combine a half step faster (4.45? ), however, he could easily be a Top-15 pick. He is a great football player who can shore up the back end of a defense with ferocious hitting power. An impressive combination of power, balance and speed. A thick, compact guy (5’9, 200 lbs. – 4.5 40) who can put on more good weight, and tote the rock at a solid 215-220 lbs. without impacting his athleticism. Decisive, natural cut-back guy. Puts his foot in the ground and explodes through the hole. Reminds me a lot of Devonta Freeman of the Atlanta Falcons. Freeman was a 4th-round pick, which sounds about right for Verdell, as well. A wide receiver with the height and speed to take the top off of a defense. A threat to score from anywhere on the field. Impressive triangle numbers (6’2, 175 lbs.- 4.36 40). His 40 time has not been verified, but make no mistake he is very fast on tape. He hasn’t finished growing, either. His dad is reported to be 6’5 and his mother is 5’10. He could easily end up 6’4 to 6’6. A.J. Green of the Cincinnati Bengals comes to mind when I watch Davis’ tape. Having said that, I’m reluctant to assign a 1st-round grade (like Green carried) to Davis. A 3rd or 4th-round is more appropriate. 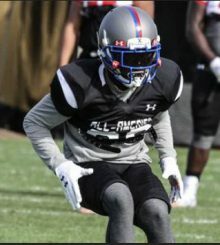 A short athletic two-way guy in high school and although he was a very productive all-purpose running back, it appears that his future lies on defense as a slot cornerback based on compact size (5’9, 160 lbs.- 4.5 40). He is a fire hydrant in the slot able to brush off the wide receiver rubs. A fearless, quick-twitch guy. Due to his size/stature his football future is limited, but there is a need for slot corners in the NFL. One of the best is Lamarcus Joyner, of whom Redd reminds me. Joyner was taken in the second round of the 2014 draft. I’m not sure Redd will go that high. Slot (nickel) corners tend to go in the 3rd or 4th rounds. A dual-threat quarterback dynamo. He has been tutored by Jeff Garcia and Akili Smith among others, since the seventh grade. Very polished in his mechanics. Sets his feet whether he’s in the pocket or on the roll out. Excellent runner. Elite talent at extending the play. Can make all of the throws and has a nice over-the-top delivery. Reminds me of Russell Wilson of the Seattle Seahawks. Similar stature and athleticism. Solid 3rd-round grade. I would not be shocked if he went higher, since NFL teams tend to reach for quarterbacks more than any other position. Though he played outside linebacker in high school and is listed that way by most internet scouting services, he looks like an inside guy to me. He lacks the height to play OLB in a 3-4 scheme. Most 3-4 outside guys are 6’4 to 6’6. His triangle numbers (6’1, 225 lbs.- 4.5 40) are ideally suited to moving inside, especially when you consider he will be playing at 240-245 lbs. in a few years. His size and athleticism reminds me a little of Bobby Wagner of the Seattle Seahawks. 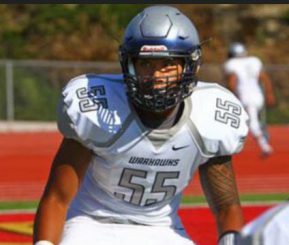 Though Wagner was taken in the second round, I’m guessing that Slade-Matautia is more of a 3rd-round grade because inside linebackers have continued to get bigger in the last few years. A quick, athletic guy (6’4, 295 lbs. – 5.0 40) that projects as a 3-4 defensive end. Played at one of the toughest high school leagues in the country. Can push the pile, hold the point, and set an edge. A 6th-round grade. A two-way star at powerhouse St. Mary’s High School near Stockton, California. I like him best at guard which fits his body type (6’4, 300 lbs.- 5.3 40). 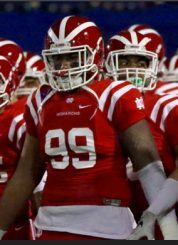 A mauler that just engulfs and overwhelms his opponents at the high school level. Surprisingly athletic with a 98 SPARQ score. A 6th-round grade. All State first team offensive lineman with a frame (6’4, 295 lbs.) to carry more good weight. Not very athletic, but plays with a mean streak on tape. His future is to move inside to guard from where he played in high school. A 7th-round grade. An undersized inside linebacker (6’0 – 200 lbs.) that excelled in high school, will be good at the collegiate level, and struggle at the pro level. It is unlikely that he can put on the minimum 35 lbs. of good weight to play in the middle in the NFL. And even if he did, he would still be undersized. Having said that, he is a ferocious hitter and idolizes the great Junior Seau. A free agent with an excellent chance to make a roster. A premier punter and placekicker from the Chris Sailer Kicking Academy. Projects as an excellent kicker at the collegiate level. His future at the NFL is less certain because there are so few opportunities available at that level every year. A free agent with a 50-50 chance to make a roster. In my opinion the seventeen student-athletes listed above and signed by Oregon Ducks in the 2017 recruiting cycle, have the talent to play at the next level beyond college football – 17 out of 24 in the overall class is nearly 71%. That’s pretty good. We can leave the “Class Recruiting Rankings” to the star gazers and the internet geeks. Based upon a little research, this class may very well be the foundation of a National Championship team.